I created this packaging design for my former employer, Fischbach USA. 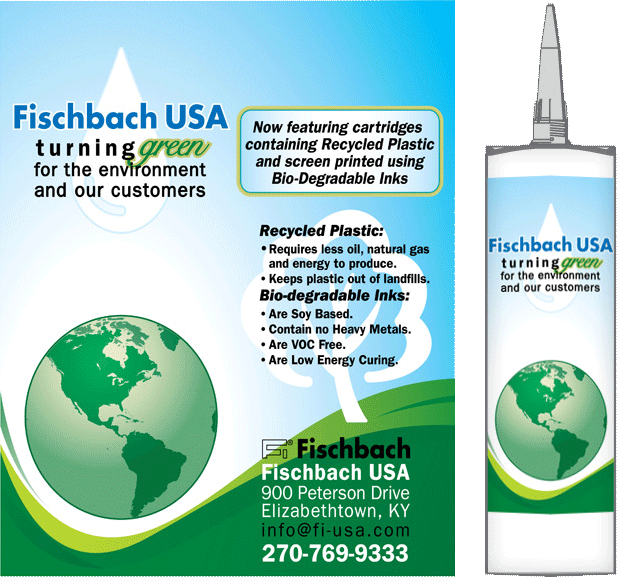 Fishbach is an international company that is the world’s leading producer of sealant cartridges. These cartridges typically contain caulk and other sealants for household and industrial use. I worked in house at one of the US offices, which is located here in Kentucky. Most of the work I performed during my time there involved updating text on other companies’ arts. Companies such as DAP and GE come to mind. In this case, my employers assigned me a project to flex my creative muscles. I designed this screen printed promotional item in order to tout the company’s environmentally friendly practices. Fishbach only requested that I use a certain set of colors and devise a nature theme. They also provided me with the copy for the tube. The rest of the details were up to me. This special run cartridge featured a conservation theme. As such, Fischbach partially manufactured it with recycled plastic and then tinted it a faint shade of green. The tube stated that the inks on the design were both soy based and biodegradable. Since the copy centered around conserving Earth’s natural resources, I went with a “clean Earth” theme. The green grass meets blue skies. A refreshing dewdrop and a globe surround the rolling hills. You can almost smell the fresh air! Our screen printing process limited me to using five solid ink colors. Therefore, I made the most of that limitation. I have always prided myself on making the most of the least in my clients’ print projects. Do you need a packaging design that stands out above your competitors? Trust a graphic designer with the skill and experience you need. Contact me today!